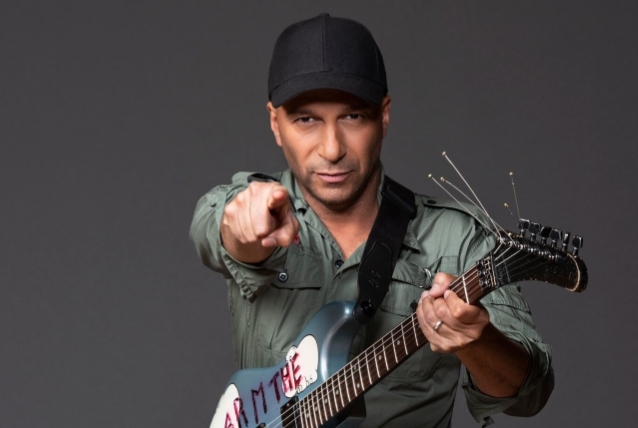 Chris Cornell's AUDIOSLAVE bandmate Tom Morello says that he "would be happy" to add his name to the online petition to re-name the recently photographed black hole after the late singer. The very first image of the cosmic phenomenon was revealed last week — and some music fans want it named in tribute to Cornell and SOUNDGARDEN's 1994 track "Black Hole Sun". Asked by Sean Stewart of the Rock 105 WRXR radio station in Chattanooga, Tennessee for his thoughts on the petition, Morello said (hear audio below): "I heard that. I think that would be really nice. I don't know who you send that petition to, but I'd be happy to officially add my name to that… That seems absolutely appropriate." The petition was started by Giuliana Jarrin, who launched a Change.org petition to use the black hole to honor Cornell and "Black Hole Sun". "'Black Hole Sun', written by Chris Cornell, is without a doubt SOUNDGARDEN's most recognisable and most popular song, and one of the biggest anthems of the '90s," she wrote in the description. "For this reason, and the impact Chris Cornell had in the lives of so many and music itself, I ask NASA, the Event Horizon Telescope Collaboration and all the astronomers and scientists involved in this discovery, to name this black hole after Chris Cornell. This would be a 'surreal' and amazing way to honour his life and his contribution to music." Cornell, who died in 2017, wrote "Black Hole Sun", which topped the Billboard Mainstream Rock Tracks and spent a total of seven weeks at No. 1.